At least 13 people are dead amid 72 sickened in 18 states in an outbreak of listeria food poisoning tied to contaminated cantaloupes, federal health officials said Tuesday. The latest confirmed as of Monday morning, according to Centers for Disease Control. But they may well rise in the still-widening outbreak that now ranks as the deadliest in the United States in more than a decade. Listeria is a common bacterium that typically causes mild illness in healthy people, but can cause severe illness in older people and those with compromised immune systems. It also can cause miscarriages and stillbirths in pregnant women and severe infections in new babies. Listeria infections lead to about 1,600 serious illnesses each year and about 260 people die, according to the CDC. For many patients, the disease can be treated with antibiotics. The Rocky Ford-brand cantaloupes from Jensen Farms were shipped from July 29 through Sept. 10 to Arkansas, Arizona, California, Colorado, Idaho, Illinois, Kansas, Minnesota, Missouri, Montana, Nebraska, New Jersey, New Mexico, New York, North Carolina, North Dakota, Ohio, Oklahoma, Pennsylvania, South Dakota, Tennessee, Texas, Utah, Virginia and Wyoming. Rocky Ford cantaloupes are the very best. Not this year, though. Thanks for the info. My Mom bought 2 last night and my Dad has littered the house with notes warning of the dangers...Of course, he never bothered to write down the brand. But .... But ..... The greenie-wienies, Vegans and health-nutz always tell us that fresh raw vegatables and fruit is the only safe food and all cooked meat and processed foods are evil. Always wash your cantelopes before you cut them. They can also transmit E-coli. Following that line of thought, it would be nice to know if this was conventional or organic produce. I’m thinking conventional because if it were organic, the article would most likely have made sure to mention it. Is this another ‘fertilizer’ issue? I read a year or two ago that Cantaloups were the “dirties” food you could buy. My wife always washes them with soap and water before cutting them up, then lets them dry, and never ever hold the rind while you eat, cut the fruit out of the rind, of course, we are not eating them currently. Cucumis melo and I do need a good hand... yes, most definitely. Just wash the outside of the cantaloupe before cutting into it. 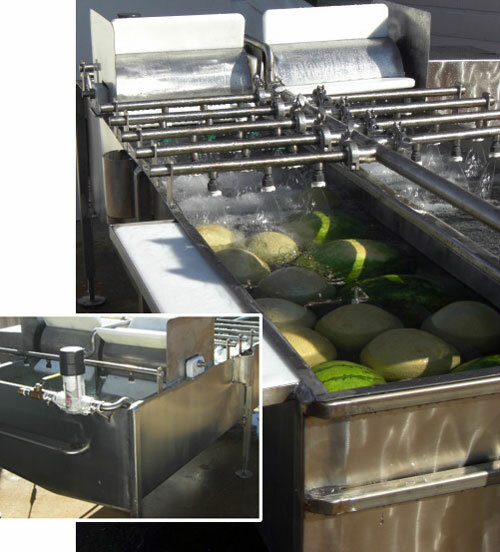 No problem...I have a high-powered, stainless steel, industrial strength melon washer.. Thanks. I know to wash the outside, but my Dad is 80 and worried about eating the two we bought. I know one of the people who was hospitalized in CO bought the store bought cut pieces. I see. I hope they are alright. Ooops. I READ it wrong! Either way, I hope they are O.K.